Description You're never too young to start developing muscle strength and dexterity and what a better way for your child to start than right along with you. BabyCise has created a 60-minute VHS video cassette that will help you spend fun "quality time" with your infant! Tape is divided into five 10-minute exercise segments which demonstrate flexibility, muscle tone, and coordination from newborn through toddler. 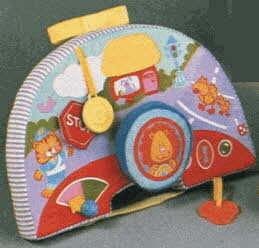 Includes tape, four and eighteen inch plastic bells that squeak and rattle, 3x5 ft. exercise mat, 8x24 in. inflatable bolster, and three inflatable 8x15 in. triangle play blocks. 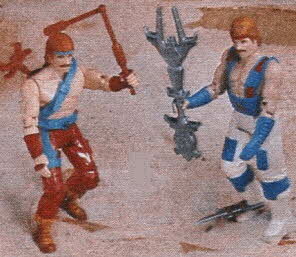 Description Articulated hero action figures. Each comes with its own assault weapons system that mounts to figure's "exo-frame". 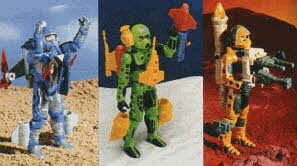 Choose from Ace McCloud (air assault), Max Ray (sea assault), or Jake Rockwell (land assault). Description Chuck Norris action figures have karate-type action. Chuck Norris in battle gear does the karate chop; in training he does the Dragon whip kick. Description Let your child convert a castle to a farmhouse in nothing flat. 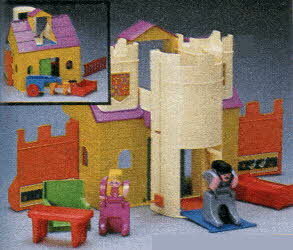 Castle has drawbridge that lowers, tower with working elevator, slide and secret staircase. Flip roof, turn the walls and, presto, castle is a farm with silo, horse and cart, trough. Princess Faira and Sir Blade included. Description Our hero! 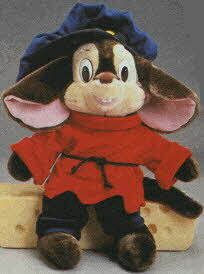 Fievel Mousekewitz is the star of the 1986 animated Steven Spielberg presentation "An American Tail". This acrylic plush character is eighteen inches tall. For ages three and up. Description This Garfield dome tent is "purr-fect" for catnapping. 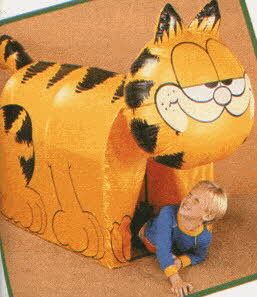 Has inflatable head and tail, measures 42x26x34 inches. Description Meet Jem ($11.99), the rock sensation with flashing LED earrings that light up at the touch of a button. On stage, she's the hottest female vocalist in town. Off stage, she's Jerrica, a sleek executive. There are also The Holograms ($9.99 each), Jem's awesome back-up band. They each play a guitar and you can hear their music from the Jem animated series on the cassette tape that comes with each doll. 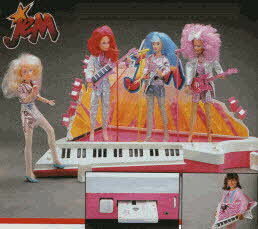 Don't forget to get the rockin' Jem Star Stage ($49.99) that plays any pre-recorded tape. Converts to an office for Jerrica and includes three play microphones, spotlights, office equipment, and lots of other accessories. Description Kids will feel like they're flying high in the "Jet Copter". 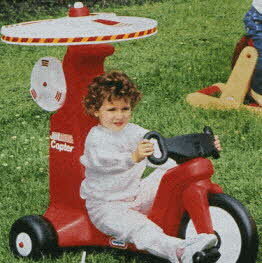 Hear the realistic "thump, thump" and watch the rotor top spin when the copter is moving. Top stops when touched. Full-back seat makes it easier for little ones to pedal and wide wheelbase gives stability. For ages three to six years old. Description Children will stretch their imagination and explore the world around them with these plastic building blocks. 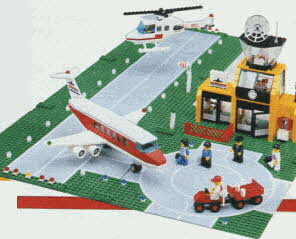 Legoland airport set has runaway, two planes, and control tower. Description My Buddy and his Kid Sister are tough enough for rough and tumble play, yet cuddly enough for big bear-hugs. 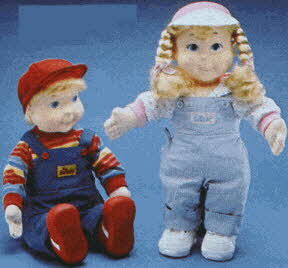 These soft-bodied dolls have vinyl heads with rooted hair. Can wear clothes(5) below or 3 to 6-month infant clothing. Description Cute? Cuddly? No chains can hold My Pet Monster. Plastic chain is split in the middle for realistic "breakouts". Manacle bracelets have fabric closure for easy opening. Handcuff both his hands, both your hands, or get handcuffed together. Acrylic plush, 23-inches tall. For ages four and up. Description Introducing Nerfuls, the fun little critters that are bound to bring out the chuckle in every child. 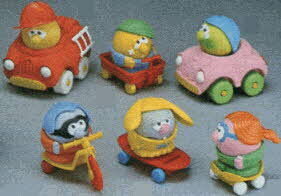 Each set includes a Nerful and a set of wheels to get around. 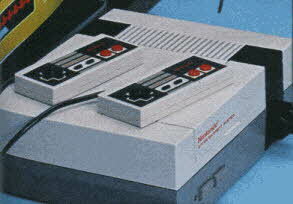 Description Introducing the Nintendo Entertainment System. It's a fully equipped video system with the most progressive components such as a robot and a light-sensing Zapper Light Gun (sold separately), true to life graphics and a vast library of games. Plus, it's not just for kids. The system is both simple and sophisticated enough to challenge the abilities of everyone in your family. The core of the system is the Nintendo Control Deck. Its compact and sleek design is just the beginning. Inside the control deck are two microchips that provide extremely high quality and real-life sound generation. Includes Super Mario Brothers game, two controllers with six feet cords, and hookup accessories. Description Everyone wants the Huddles on their team! They're perfect for play or display and have soft plush bodies. 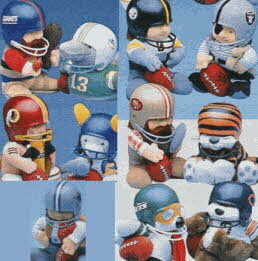 Choose from different teams: Giants, Dolphins, Redskins, Rams, Steelers, Raiders, 49ers, Bengals, Jets, Bears, and Cowboys. 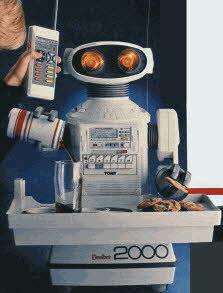 Description Omnibot 2000 can be the life of your party. It can bring you things, pour and serve drinks or hors d'oeuvres from its detachable tray. The articulated arm and grasping hand serve everything smoothly. Cassette tape player adds the party music. 7 day/24 hour programmable timer/tape memory enables this robot to remember your every need. The remote control unit commands all functions. Omnibot 2000 can move at two speeds over almost any surface... even shag carpeting. Moving head and flashing eyes add "life". Description Score four "hits" to win, that's the objective of a Photon Warrior. This double warrior set includes everything you need for target practice or competition between two players. Photon Phasers shoot infrared light beams at each other, the target or the helmet from 40 to 50 feet away, day or night. They emit a different sound when fired, hit, hit four times, or reset. Plus, they have LEDs that light up when hit. The control-module chest plates attach to the helmets and Phasers and emit the same sound as the Phasers. 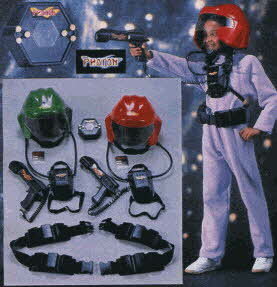 Helmets have flashing LEDs, plus a tube that connects the control module for transmitting sound the the helmet if it is "hit" by a Phaser beam. Comes with practice target, belts with holsters, Photon passports, and more. Description You'll go hog wild over Pig Pong. Squeeze the little porkers belly to blow the puff ball over the net and onto your opponents side to score. Every time you score, slide your score keeping pig on the net up one notch. First to reach eleven points wins. 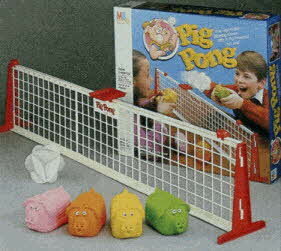 Includes four plastic pigs, net, ball, and rules. For two to four players. Description You can pop up in the Popples playhouse. 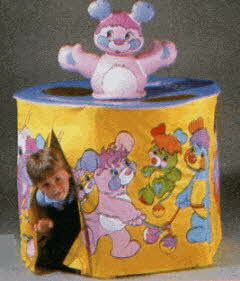 Two topside openings let you pop up to visit with inflatable Party Popples figure. With two clear vinyl windows. For ages three and up. 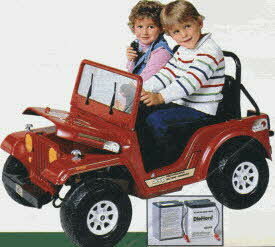 Description Take a friend along for the ride in the Jeep all-terrain vehicle. Hood opens for battery storage. Keep the windshield clean with the hand-operated wipers or lower it when the mood strikes. The tailgate raises and lowers and there is extra storage behind the seat. Passenger handle can also be used as a glove compartment when traveling alone. 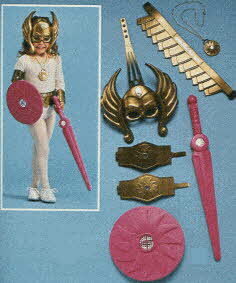 Description She-Ra Princess of Power dress-up set comes with gold-color apparel and 10-in. shield, play jewel ring, glow-in-the-dark sword. 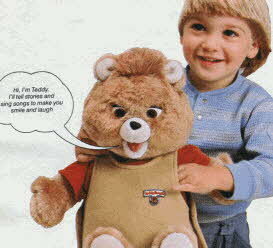 Description He's a cuddly plush friend with a specially designed cassette player inside... he's Teddy Ruxpin! Just unsnap his playsuit and pop in the special animation tape included. The colorful picture book lets children follow the adventure as Teddy sings and speaks. Any audio tape can be played in Teddy Ruxpin, but only specially programmed tapes bring the animation to life. 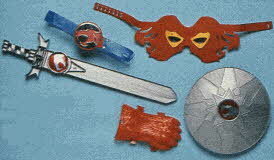 Description Thundercats battle gear includes official Sword of Omens, ten inch shield, mask, glove, and belt. Description The Touch ems back seat driver fits on most car seats or strollers. It's thick foam rubber inside. Colorful outside is beautifully detailed with eight fun activities to keep baby smiling and busy. Steering wheel turns, sun and moon rattle, duck squeaks, horn honks, key is a teether, and more. Description Bring the music along with this push toy turtle xylophone. 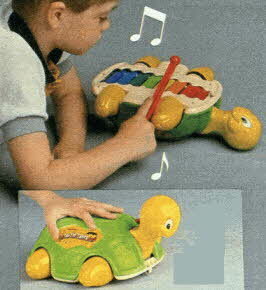 Turn the turtle over, and play a tune from the sheet music or make up your own tune. Color-keyed song sheets and playing mallet included. Description Lift up the adorable fur-look acrylic Watchimal head and surprise... it's a wristwatch. Tells time, date and seconds. Easy hook-and-loop closure adjusts to any size wrist. Choose from Butterfly, Bear, Mouse, or Elephant.